Saint Tikhon of Zadonsk, Bishop of Voronezh (in the world Timothy), was born in the year 1724 in the village of Korotsk in the Novgorod diocese, into the family of the cantor Sabellius Kirillov. (A new family name, Sokolov, was given him afterwards by the head of the Novgorod seminary). His father died when Timothy was a young child, leaving the family in such poverty that his mother was barely able to make ends meet. She wanted to give him to be raised by a neighbor, a coachman, since there was nothing with which to feed the family, but his brother Peter would not permit this. Timothy often worked a whole day with the peasants for a single piece of black bread. As a thirteen-year-old boy, he was sent to a clergy school near the Novgorod archbishop’s home, and earned his keep by working with the vegetable gardeners. In 1740, he was accepted under a state grant set up for the Novgorod seminary. The youth excelled at his studies. Upon finishing seminary in 1754, he became a teacher there, first in Greek, and later in Rhetoric and Philosophy. In the year 1758, he was tonsured with the name Tikhon. In that same year they appointed him to be prefect of the seminary. In 1759, they transferred him to Tver, elevating him to be archimandrite of the Zheltikov monastery. Later, they appointed him rector of the Tver seminary and, at the same time, head of the Otroch monastery. His election as bishop was providential. Metropolitan Demetrius, the presiding member of the Holy Synod, had intended to transfer the young archimandrite to the Trinity-Sergiev Lavra. On the day of Pascha, at Peterburg, Archimandrite Tikhon was one of eight candidates being considered for selection as vicar-bishop for Novogorod. The lot fell on him three times. On the same day, during the Cherubic Hymn, Bishop Athanasius of Tver, without realizing it, commemorated him as a bishop while cutting out particles from the prosphora at the Table of Oblation. On May 13, 1761 he was consecrated Bishop of Keksgolma and Ladoga (i.e., a vicar bishop of the Novgorod diocese). The saint considered it essential that each priest, deacon and monk have a New Testament, and that he should read it daily. In an Encyclical, he called on pastors to perform the Holy Mysteries with reverence, with the fear of God, and love for one’s neighbor. (An Explanation of Christian Duties was often republished in Moscow and Peterburg during the eighteenth century). At Voronezh the saint eradicated an ancient pagan custom, the celebration in honor of Yarila (a pagan god associated with the fertility of grain and cattle). In the outlying districts where military units of the Don Cossacks were dispersed, he formed a missionary commission to restore sectarians to the Orthodox Church. In 1765, Saint Tikhon transformed the Voronezh Slavic-Latin school into a seminary. He invited experienced instructors from Kiev and Kharkhov, and planned the courses for it. He exerted much attention and effort to build up both the churches and the school, and to guide pastors to understand the need for education. The saint was unflagging in his efforts to administer the vast diocese, and he often spent nights without sleep. In 1767, poor health compelled him to give up running the diocese and withdraw for rest to the Tolshevsk monastery, at a distance 40 versts from Voronezh. In 1769, the saint transferred to the monastery of the Theotokos in the city of Zadonsk. Having settled into this monastery, Saint Tikhon became a great teacher of the Christian life. With deep wisdom he set forth the ideal of true monasticism in his Rule of Monastic Living and his Guidances to Turn from the Vanity of the World, and in his own life he fulfilled this ideal. He kept strictly to the precepts of the Church. Zealously (almost daily) he visited the temple of God, and he often sang and read in the choir. In time, out of humility, he altogether ceased participating and serving, but merely stood in the altar, reverently making the Sign of the Cross over himself. He loved to read the Lives of the Saints and the works of the holy Fathers. He knew The Psalter by heart, and he usually read or sang the Psalms on his journeys. The saint underwent much tribulation because he had to leave his flock. When he recovered his health, he thought about returning to the Novgorod diocese, where Metropolitan Gabriel had invited him to head the Iveron Vallaisk monastery. But when his cell-attendant mentioned this to the Elder Aaron, he declared: “Are you mad? The Mother of God does not direct him to move away from here.” The cell-attendant conveyed this to His Grace. “If that is so,” said the saint “I shall not move away from here,” and he tore up the invitation. Sometimes he journeyed to the village of Lipovka, where he celebrated church services at the Bekhteev house. The saint journeyed also to the Tolshev monastery, which he loved for its solitude. The fruition of all his spiritual life were the books that the saint wrote while in retirement: A SPIRITUAL TREASURY, GATHERED FROM THE WORLD (1770), and ON TRUE CHRISTIANITY (1776). Once, a fool named Kamenev struck the saint on the cheek saying, “Don’t be so haughty” The saint, accepting this with gratitude, gave the fool three kopeks every day for the rest of his life. All his life the saint “in troubles, and sorrows, and insults... joyfully endured, mindful that there can be no crown without the victory, nor victory without effort, nor effort without struggle, nor struggle without enemies” (Ode 6 of the Canon). Strict towards himself, the saint was indulgent towards others. On the Friday before Palm Sunday, he entered the cell of his friend the schemamonk Metrophanes, and he saw him at table together with Cosmas Ignatievich, of whom he was also fond. There was fish on the table, and his friends became upset (Fish is not permitted during Lent, except for Feast days). The saint said, “Sit down, for I know you. Love is higher than fasting.” To further calm them, he ate some of their fish soup. He especially loved the common folk, and comforted them in their grievous lot, interceding with the landowners, and moving them to compassion. He gave away his pension, and gifts from admirers, to the poor. Saint Tikhon prophesied much about the future, particularly the victory of Russia over the French in 1812. More than once they saw the saint in spiritual rapture, with a transformed and luminous face, but he forbade them to speak about this. For three years before his repose he prayed each day, “Tell me, O Lord, of my end.” And a quiet voice in the morning dawn said, “It will be on a Sunday.” In that same year, he saw in a dream a beautiful meadow with wondrous palaces upon it. He wanted to go inside, but they said to him: “In three years, you may enter. For now, continue your labors.” After this the saint secluded himself in his cell and admitted only a few friends. Both clothing and a grave were prepared for the time of his death. He often came to weep over his coffin, while standing hidden from people in a closet. A year and three months before his death, in a vivid dream, it seemed to the saint that he was standing in the monastery church. A priest of his acquaintance was carrying the Divine Infant, covered with a veil, out of the altar through the Royal Doors. The saint approached and kissed the Infant on the right cheek, and he felt himself stricken on the left. Awakening, the saint sensed a numbness in his left cheek, his left leg, and a trembling in his left hand. He accepted this illness with joy. “The ladder,” said Cosmas, “is the way to the Heavenly Kingdom. Those who helped were those you have helped by your advice, and they remember you.” The saint said with tears, “I thought so, too. I feel that my end is near.” He frequently received the Holy Mysteries during his illness. 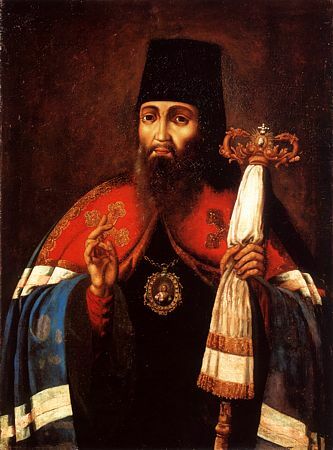 Saint Tikhon died, as was revealed to him, on Sunday August 13, 1783, at the age of fifty-nine. The first uncovering of his relics occurred on May 14, 1846. Saint Tikhon’s glorification took place on Sunday August 13, 1861. From your youth you loved Christ, O blessed one. / You have been an example for all by word, life, love, faith, purity, and humility. / Therefore, you now abide in the heavenly mansions, / where you stand before the throne of the All-holy Trinity. / Holy Hierarch Tikhon, pray for the salvation of our souls. Successor to the Apostles, / adornment of hierarchs, and teacher of the Orthodox Faith: / beseech the Master of all to grant peace to the universe / and to our souls great mercy.